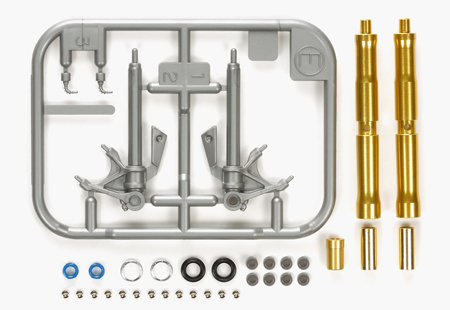 Add an extra layer of realism to the already-stunning 1/12 Ducati 1199 Panigale S model with this detail-up parts set. 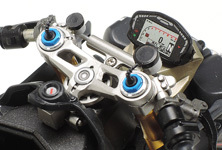 It features gold-color anodized parts to recreate outer tubes and the oil damper reservoir tank, plus blue fork top parts, black anodized outer tube end parts, and even minute aluminum pieces to depict the floating pins on the brake discs. The inner tube is also recreated using gold colored metal-plated brass for highly authentic visuals. Plastic parts are included to capture the fork bottoms and wires. ★Gold-colored outer and inner tubes, etc. 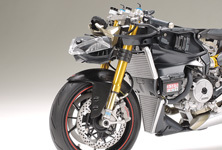 crank up the realism of the 1/12 Ducati 1199 Panigale S even further! ★Incredible detail and accuracy is provided by blue anodized aluminum tops with wires also recreated. 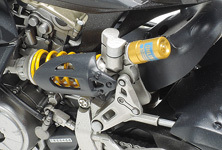 ★This set gives an accurate gold anodized recreation of the reservoir on the left-side rear damper unit. The information on this page is current as of July 3, 2014. Specifications are subject to change without notice.